About: Halal are a chain of Egyptian restaurants specialising in halal meats that are made into traditional regional dishes.
. . . Fantastic Food . 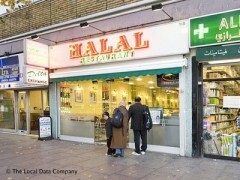 . .
We have been to the Halal Restaurant 3 times now and it has been fantastic each time. The food is very reasonably priced and you get generous portions and most importantly the food tastes fantastic! I had meal deal 1 which is a Chicken Shwarma wrap with chips and a can of drink for £5.50!!!! The wrap is really tasty. I would definitely recommend it and i will definitely be going back again soon! Lovely food for very reasonable price compared to more expensive establishments down the road. The kebabs are excellent. We were on holiday and ate there almost every other day.